What: Sci-fi hip-hop supergroup comprised of Del The Funkee Homosapien, Dan The Automator, and Kid Koala. 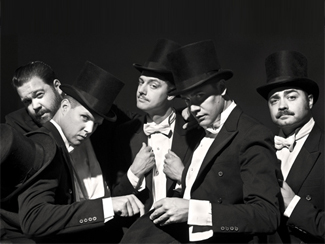 Why: Ready to release their second album Event II this coming Tuesday, September 30 – a mere 13 years after their debut – they’re going all in with a North American tour where they’ll be accompanied by a full orchestra. Because why not. How: Tickets for the show are $24.50 in advance but courtesy of Union Events, I’ve got two pairs of passes to give away for the show. To enter, email me at contests AT chromewaves.net with “I want to see Deltron 3030” in the subject line and your full name in the body. Contest closes at midnight, October 10. What else: The new album is available to stream at Pitchfork for a limited time. 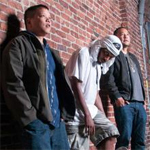 LA Weekly talks to Dan The Automator and Clash to Del about the return of Deltron. Frank YangI can pinpoint the exact date, time, and place that I became a Pet Shop Boys fan – 8PM on August 30, 2009 at the Molson Amphitheatre. That was when they took the stage – the penultimate act of the final V Fest in Toronto and part of the “Pandemonium” tour in support of that year’s Yes – to the sampled voices of “Heart” and kicked off one of the most ridiculously entertaining hours of live music I can remember. I’d known the songs, of course – everyone knows many of those songs even if they don’t – but the marriage of their perfect pop and over-the-top, technicoloured building block visuals was impossible to resist, and since that too-short festival-length performance, I’ve been waiting for them to come back for their own full-length show. It didn’t happen for last year’s Elysium, but for its strengths – maybe I liked it more than most because it was the first new PSB record to come out with me as a card-carrying member of their fanbase – its relatively low-key presentation may not have been the strongest foot to launch a world tour from. So thank goodness for this year’s unexpectedly fast follow-up Electric, a far more danceable and banging companion album that would get the Boys back on the road with the festival circuit in the Summer, and North America this Fall, stopping in at The Sony Centre in Toronto on Wednesday night. With no opening act, the sold-out house waited and chattered patiently until the house lights dropped and screaming (the good kind) commenced. 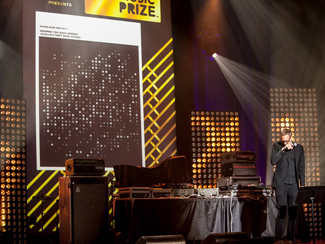 With projections of geometric abstractions and speeding tunnels on the giant scrim covering front of the stage, Messrs Tennant and Lowe took the stage behind giant glowing silhouettes, and ping-ponged from present to past with Electric opener “Axis”, Actually‘s “One More Chance”, and Elysium – all obscured behind trippy visuals – before dropping the scrim for “Opportunities” and bidding the crowd a proper “hello” with the first of many, many shouts of, “Toronto!”. 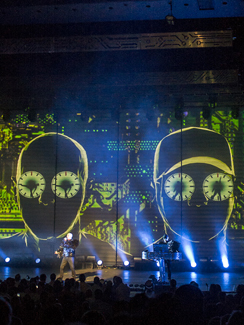 Even though the visuals of this tour were completely different from the Pandemonium tour – the Lego-esque aesthetic put aside for lasers, strobes, and the aforementioned giant projections, all tied together by a printed circuit board aesthetic – the structure was quite similar. Visually, you had Chris Lowe expressionless at his keyboard station handling the music, Neil Tennant roaming the stage in excellent voice, sometimes accompanied by a pair of dancers, and all in a dazzling and nonsensical array of costumes involving but certainly not limited to giant antlered animal masks, finely-tailored suits, disco ball helmets, and tinsel bodysuits on pogo sticks. Musically, they tied songs together into suites with corresponding choreography, and as per the opening numbers, they focused mainly on their last two albums and their platinum-selling early records, although Behaviour was curiously left out completely. 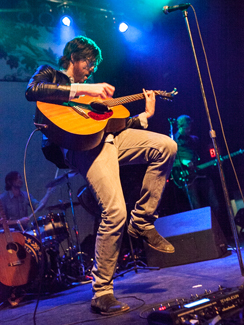 Also curious was the omission of two of Electric‘s highlights – new single “Love Is a Bourgeois Construct” and Springsteen cover “The Last To Die”. But you can’t have everything, I suppose, so wishing that some more of their ’90s singles had also made the cut in lieu of the early ’00s tracks is really besides the point. Even with a near two-hour show, a band with a catalog of classic songs as deep as Pet Shop Boys as well as very worthy current records to promote is going to leave someone’s favourites out. Probably best to focus on the fact that even so, no one was having anything but a great time and even though the Sony Centre’s seats weren’t the most conducive to dancing, we did what we could. The show’s finale was heralded by a string of the biggest tunes – “It’s A Sin”, “Domino Dancing”, “Always On My Mind”, and “Go West” are the very definition of show stoppers – but the final number was Electric closing number “Vocal”; not a classic like the others – at least not yet – but certainly a banger and if you wanted to send a giddy crowd into the night understanding that even after more than a quarter century, you’re still writing and releasing great, great songs to go with your great, great shows, you could do far worse. Global News, Panic Manual, and Live In Limbo also have reviews of the show, and Philly.com and The New Statesman interviews. The New York Times has the advance stream of Yuck’s second album Glow & Behold, being released September 30. Also out next week is Johnny Flynn’s new long-player Country Mile, which is available to preview at For Folks Sake. And if that’s not enough, there’s the sampler A Recapitulation Of Johnny Flynn EP which is available to download for free (or a donation). Clash, MIPro, and New Statesman talk to Anna Calvi about her new album One Breath, which is out October 7 and from which a new song is available to stream. The History Of Apple Pie are streaming the a-side of a new 7″-single, out October 14 to coincide with their hop across the Atlantic to play CMJ. Clash premiered a stream of the first new Fanfarlo music in a while; it comes from their new EP The Sea, which will be released on October 14. Daytrotter has a session with Kate Nash, who plays The Phoenix on November 5. Though her debut album True Romance is still only a few months old, Charli XCX has released a video for a new song from her next album, which she obviously hopes will be out sooner rather than later. She plays Wrongbar on November 9. The Guardian examines the new wave of psych-rock bands coming out of the UK including Temples, who are at The Horseshoe on November 20 ahead of releasing their full-length debut next year. Foals have a new clip from their latest, Holy Fire. Savages have released a new video from Silence Yourself. Sky Larkin share their favourite mottos with Clash, while ZME Music settles for a regular old interview. NPR has a video session and Exclaim an interview with CHVRCHES. Spin talks to Elvis Costello and Questlove of The Roots about their collaborative record Wise Up Ghost. Wild Honey Pie have posted a video session with Camera Obscura. As part of their ongoing 4AD week – marking the release of Facing The Other Way, a new book about the legendary label, Drowned In Sound talks to Vaughan Oliver, the graphic artist responsible for the 4AD’s signature visual style.